1 February 1943: During World War II, the 414th Bombardment Squadron (Heavy), 97th Bombardment Group (Heavy), 12th Air Force, U.S. Army Air Forces, was on a mission to attack the docks at the port of Tunis in order to cut the supply chain to the German and Italian armies operating in Tunisia. 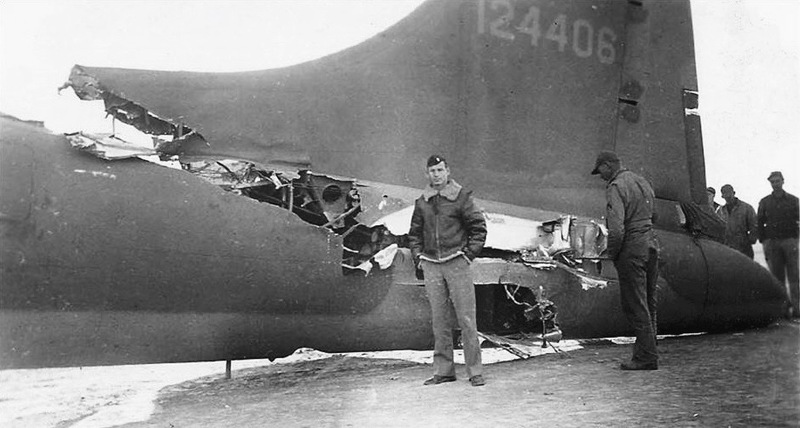 A single-engine Messerschmitt Bf 109G fighter defending the city collided with All American III, a Boeing B-17F-5-BO Flying Fortress, serial number 41-24406, which was under the command of Lieutenant Kendrick R. Bragg, Jr., U.S. Army Air Corps. The fighter cut diagonally through the bomber’s fuselage, carried away the left horizontal stabilizer and elevator, and damaged the flight control cables. The rugged design and construction that made the Flying Fortress a legend allowed the airplane to fly another 90 minutes to its home base at Biskra Airfield, Algeria. Lieutenant Bragg made a careful landing, holding the tail off the runway as long as possible. None of the ten men aboard were injured. All American III was repaired and was returned to service. It was reassigned to the 352nd Bombardment Squadron (Heavy), 301st Bombardment Group (Heavy) at St. Donat, Tunisia, and flew till nearly the end of the war. It was dismantled for salvage at Lucera Airfield, Italy, 6 March 1945. 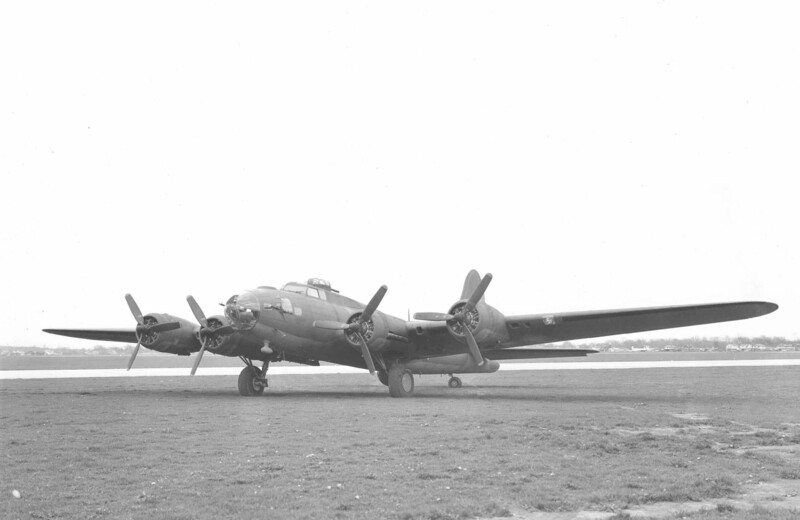 41-24406 was assigned to the 92nd Bombardment Group at Bangor, Maine, 13 July 1942. It was flown across the Atlantic Ocean to RAF Polebrook, and reassigned to the 414th. The B-17 arrived at Maison Blanche, Algeria, 13 November 1942. It then traveled to Tafaroufi, Algeria, and then to Biskra, arriving there on Christmas Day. The Boeing B-17F Flying Fortress was a four-engine heavy bomber operated by a flight crew of ten. It was 74 feet, 8.90 inches (22.781 meters) long with a wingspan of 103 feet, 9.38 inches (31.633 meters) and an overall height of 19 feet, 1.00 inch (5.187 meters). The wings have 3½° angle of incidence and 4½° dihedral. The leading edge is swept aft 8¾°. The total wing area is 1,426 square feet (132.48 square meters). The horizontal stabilizer has a span of 43 feet (13.106 meters) with 0° incidence and dihedral. Its total area, including elevators, is 331.1 square feet (12.18 square meters). 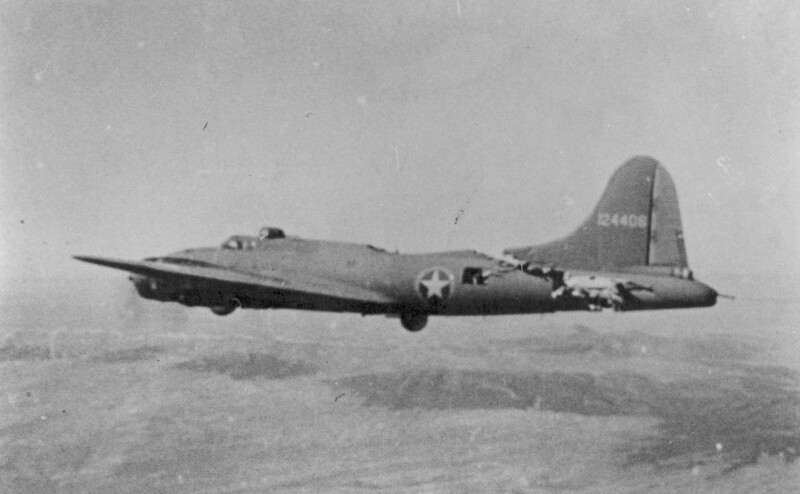 The B-17F had an approximate empty weight of 36,135 pounds (16,391 kilograms), 40,437 pounds (18,342 kilograms) basic, and the maximum takeoff weight was 65,000 pounds (29,484 kilograms). 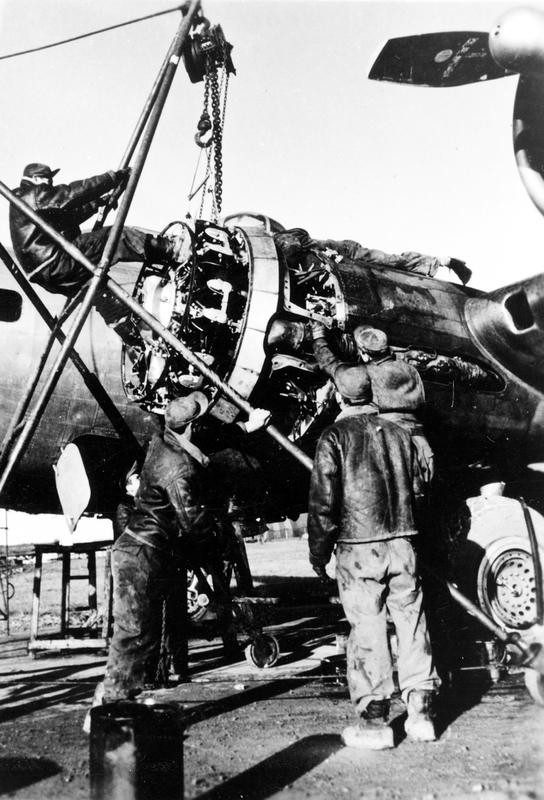 The B-17F was powered by four air-cooled, supercharged, 1,823.129-cubic-inch-displacement (29.876 liters) Wright Cyclone G666A (R-1820-65)¹ nine-cylinder radial engines with a compression ratio of 6.70:1. The engines were equipped with remote General Electric turbochargers capable of 24,000 r.p.m. The R-1820-65 was rated at 1,000 horsepower at 2,300 r.p.m. at Sea Level, and 1,200 horsepower at 2,500 r.p.m. for takeoff. The engine could produce 1,380 horsepower at War Emergency Power. 100-octane aviation gasoline was required. The Cyclones turned three-bladed, constant-speed, Hamilton-Standard Hydromatic propellers with a diameter of 11 feet, 7 inches (3.835 meters) though a 0.5625:1 gear reduction. The R-1820-65 engine is 3 feet, 11.59 inches (1.209 meters) long and 4 feet, 7.12 inches (1.400 meters) in diameter. It weighs 1,315 pounds (596 kilograms). The B-17F had a cruising speed of 200 miles per hour (322 kilometers per hour). The maximum speed was 299 miles per hour (481 kilometers per hour) at 25,000 feet (7,620 meters), though with War Emergency Power, the bomber could reach 325 miles per hour (523 kilometers per hour) at 25,000 feet for short periods. The service ceiling was 37,500 feet (11,430 meters). With a normal fuel load of 1,725 gallons (6,530 liters) the B-17F had a maximum range of 3,070 miles (4,941 kilometers). Two “Tokyo tanks” could be installed in the bomb bay, increasing capacity by 820 gallons (3,104 liters). Carrying a 6,000 pound (2,722 kilogram) bomb load, the range was 1,300 miles (2,092 kilometers). 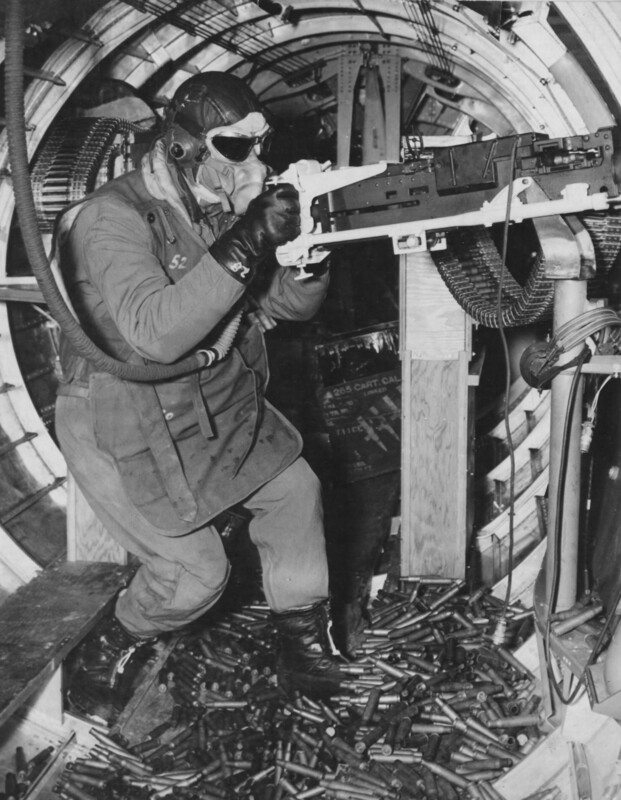 The B-17F Flying Fortress was armed with up to 13 Browning AN-M2 .50-caliber machine guns. Power turrets mounting two guns each were located at the dorsal and ventral positions. The maximum bomb load was 20,800 pounds (9,435 kilograms) over very short ranges. Normally, 4,000–6,000 pounds (1,815–2,722 kilograms) of bombs were carried. The internal bomb bay could be loaded with a maximum of eight 1,600 pound (725.75 kilogram) bombs. Two external bomb racks mounted under the wings between the fuselage and the inboard engines could carry one 4,000 pound (1,814.4 kilogram) bomb, each, though this option was rarely used. The B-17 Flying Fortress first flew in 1935, and was in production from 1937 to 1945. 12,731 B-17s were built by Boeing, Douglas Aircraft Company and Lockheed-Vega. (The manufacturer codes -BO, -DL and -VE follows the Block Number in each airplane’s type designation.) 3,405 of the total were B-17Fs, with 2,000 built by Boeing, 605 by Douglas and 500 by Lockheed-Vega. 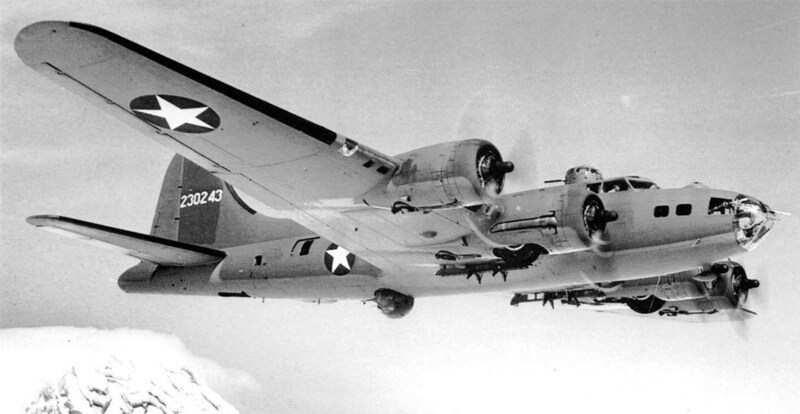 Only three B-17F Flying Fortresses remain in existence. ¹ Later production B-17F and B-17G bombers were equipped with Wright Cyclone C9GC (R-1820-97) engines.